Not only can the system be individually adapted, but it can also be expanded using sensors. Predefined parameter presets are available for monitoring. The integrated bearing database can be accessed when using the parameter presets. The presets can be easily adapted to the specific monitoring tasks with the aid of assistants. If requested by the customer, the Schaeffler Group will add user-specific parameter presets and make them available to the user. Tailor-made and flexible expansion options! Use our complete service for all your machine diagnostic needs. We offer full service: consultation, initial operation, remote service, training, rolling bearing solutions, and much more. Intelligent sensors and rolling bearings can be used to record important key values for a machine or system and communicate them to the control system. Independent machine monitoring makes it possible to automate sequences and detect deviations from the target situation early on. Thanks to condition monitoring, you profit from ongoing condition monitoring of your machines and systems. As the operator, you continuously receive information on whether your system is running optimally. In our service center, we provide you with all the important information and answers to your questions about every aspect of SmartCheck. Our service information includes the most important application examples for SmartCheck in operation, explanatory videos, informative material, and instructions for easy installation and operation. Can I operate SmartCheck with any PoE enabled switch? No, SmartCheck can only be operated with PoE switches which support the PoE standard 802.3af Mode A. 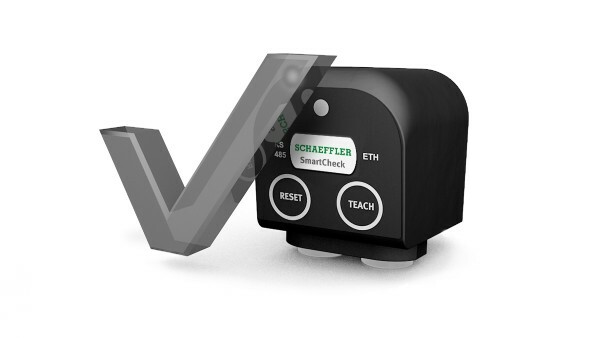 What fieldbus and ethernet protocols are supported by SmartCheck? What are the ideal machines for monitoring? Constant speed motors, pumps, fans. Why can I not connect to my SmartCheck? This is generally due to the PC settings. SmartCheck has a standard IP address of 192.168.1.100. Contact your IT systems administrator or our free support service at support.is@schaeffler.com. Is it vital that I update my SmartCheck if it is in long-term use? Every new software version contains small bug fixes and new general information. If we regard an update as compulsory, this is noted in the update information. How do I communicate with SmartCheck? Via the ethernet using TCP/IP. The only requirement is an internet browser (e.g. Internet Explorer, Mozilla Firefox). How is the system powered? 24V DC power or PoE (Power over Ethernet). What does it allow me to monitor? Components such as rolling bearings, clutches, belts, gears. But also variations in temperature, imbalances, impacts, processes and a great deal more. Why is the speed not available in the evaluation (SmartUtilityViewer) even though it is measured? The speed can be made available by configuring the speed signal as a parameter in SmartWeb. It is then possible to display the trend and to set the limit thresholds and relevant alarms. 99% of pumps are driven by a frequency converter so the speeds can vary during operation. Is this a restriction? No, this is not a restriction. In order to ensure reliable monitoring, the speed must be available to SmartCheck as an additional signal. SmartCheck saves the last timestamp and starts with this data when power is reinstated. The date and time have to be entered manually in the event of longer interruptions. What equipment do I need for an initial pilot project? We recommend the SmartCheck Starter Kit. 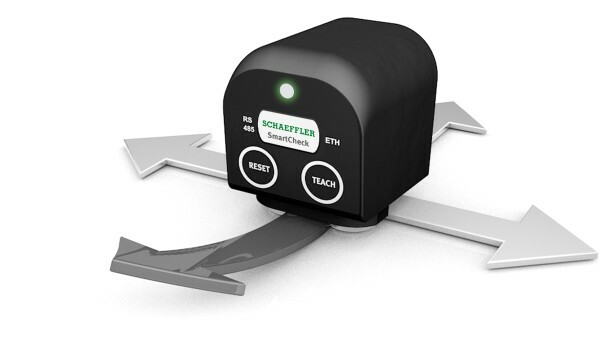 Available from a Schaeffler sales partner near you, see www.schaeffler.de/en/salespartner. Where are the current firmware updates? What are the benefits of these? Every new software version contains small bug fixes and new general information. If we regard an update as compulsory, this is noted in the update information. The firmware can be downloaded free of charge. Is a free demo-system available? Please contact a Schaeffler sales partner near you, see www.schaeffler.de/en/salespartner. Can I expand the integrated bearing database in SmartCheck? Any rolling or ball bearing from any manufacturer can be added and monitored. What do I need to power SmartCheck using Power over Ethernet (PoE)? Can the system be connected to controls? Yes, to any control using analog and digital inputs/outputs and the “Web Services” protocol as well as to Mitsubishi Controllers (L,Q, FX5) using the SLMP protocol. Where does SmartCheck have to be mounted? As close as possible to the component being monitored. Schaeffler experts can give you specific advice for your application. If you need support, just contact us at support.is@schaeffler.com. Can I install the sensor on multiple applications? The system should basically remain where it is installed. Our portfolio includes the Service Kit for special cases. This allows, for example, troubleshooting by the end user or regular measurements on different units as part of after-sales service. 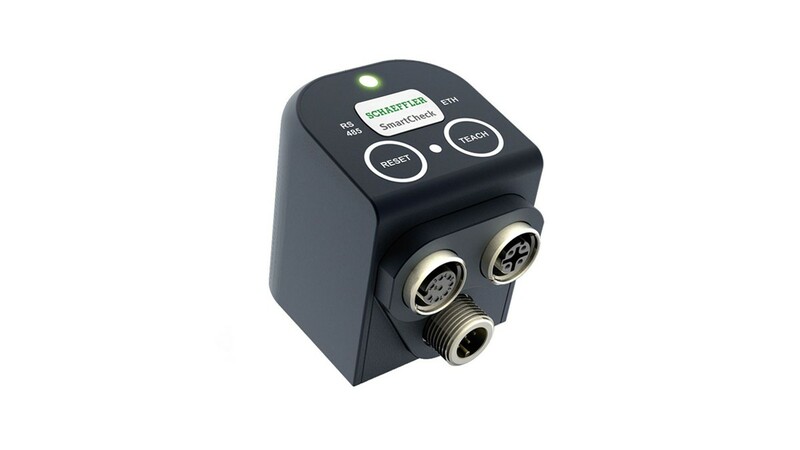 Do the M12 plug connectors on SmartCheck have a special coding? No, they are standard M12 plug connectors. The M12 ethernet cable has a D coding. Is SmartCheck available in an EX version? How do I send speed signals to SmartCheck? Via one of the two analog IN, the digital IN, or via ethernet using web services or via SmartController. Is it possible for different users to access a single SmartCheck from two different PCs at the same time via an internet browser? No, it is not possible to access a single SmartCheck (SmartWeb) from two different PCs at the same time via an internet browser. Can configurations be copied between SmartCheck units? Can I download measured data from SmartCheck? Yes, this can be done via either SmartWeb or SmartUtility. At what point does data start to thin out? If there is less than 5 MB of free memory on the data partition, the system starts to thin out the database. The browser cannot open SmartCheck. The proxy settings in the browser’s internet settings must be set to ‘automatic’ or ‘none’. Check the SmartCheck IP address. Can SmartUtility software be installed on more than one computer? No, this is a single-user license. A further license is required to install the software on another computer. Is it possible to download data or configurations from SmartCheck using SmartUtility Light? Data can be downloaded using SmartUtility Light but configurations cannot be downloaded or sent. The chargeable version SmartUtility is required for this. What user rights are required to install SmartUtility and SmartUtility Light software on a computer? Local administrator rights to the computer are required to install these software packages. Is it possible to switch the analysis between Hz and powers? Yes, the frequency axis for the spectrum can be displayed in powers. How can I save configurations? SmartUtility software is required for this. How can I analyze the data? SmartWeb includes a basic viewer. SmartUtility provides a professional viewer. Do I have to purchase the software on an individual basis? The software on the system, SmartWeb and SmartUtility Light, are included in the scope of supply. SmartUtility is a separate purchase. 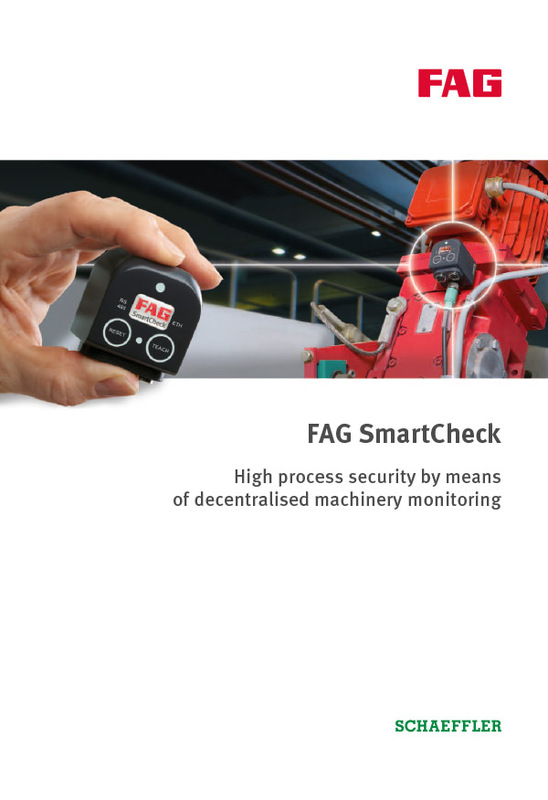 What is the minimum speed at which bearings can be monitored with SmartCheck? 48 revolutions per minute. In certain applications and special configurations, units can also be monitored at lower speeds. Experts must be consulted in these instances. If you need support, contact us at support.is@schaeffler.com. How long does SmartCheck’s memory last? This is enormously dependent on the number of configurations and the memory settings. Is it possible to send an SMS or email directly from SmartCheck? No, that is not currently an option. How many different configurations can be stored on a SmartCheck? There is no limit. However, the configurations have an effect on the speed and the available memory. We recommend the number of configurations is restricted to no more than 10. What is the minimum interval between two stored trend values? The minimum storage interval between two trend values (setting for always save) is approximately 30 seconds. Within what speed range can SmartCheck operate? Typically between 50 and 15,000 rpm. How long does SmartCheck store measured data? The system has an intelligent compression algorithm. If the memory is full, the system automatically starts to compress historical data in an intelligent manner. Relevant historical data are not lost. 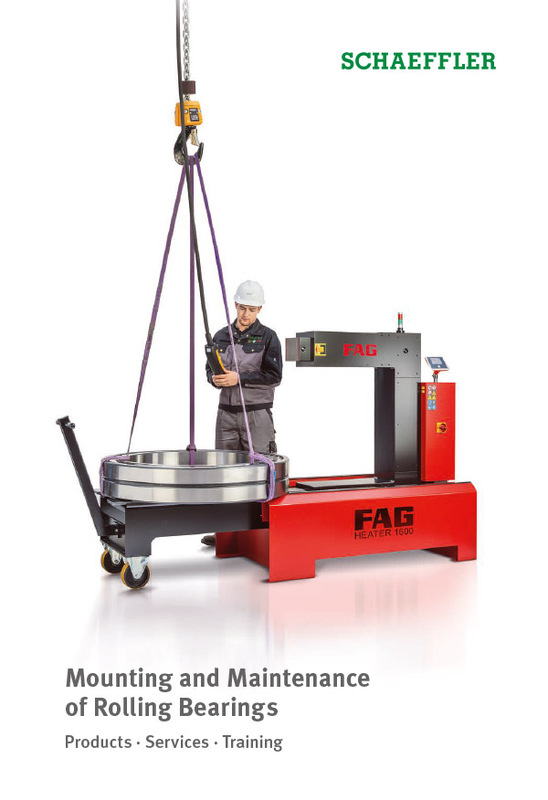 Does every type of bearing need its own measurement? No. Changes in all fitted rolling bearing supports can be monitored with the preset basic measuring settings. How are the results or status displayed? On SmartCheck itself, and with SmartWeb, SmartLamp or SmartVisual. Where are the results from the teach mode recorded? The alarm thresholds established in teach mode are recorded in the log book with an appropriate message and with the relevant parameters. How long does SmartCheck’s teach mode last? This depends on the monitoring tasks configured for the system. As delivered, the teach mode lasts approximately 9 hours. Is it possible to display the SmartCheck alarm status? Yes, the two outputs can be configured in SmartWeb. How are the alarms generalized? The system has preset alarm thresholds or these are learned when the user activates the teach mode. After this, the system automatically issues an alert if there are changes in the trend curve. There are pre-alarms and main alarms. How do I set the alarm values? Manufacturer’s preset alarm values can be set on SmartWeb by entering the values or by drag and drop. Or just use the teach mode. How do I know what the alarm thresholds are? Some machine manufacturers specify the threshold values. 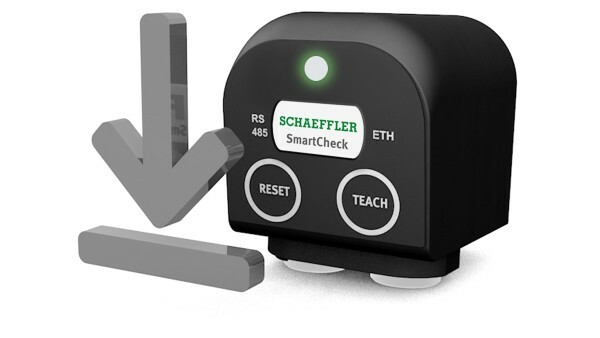 For all other cases, just use the SmartCheck automatic teach mode. SmartCheck is an e-F@ctory partner product. As part of the e-F@ctory Alliance, Mitsubishi Electric Europe joins forces with partner companies that are recognized technology and market leaders in their respective business areas. In collaboration with Schaeffler, Mitsubishi Electric offers a holistic approach for assessing the condition of a system using SmartCheck. 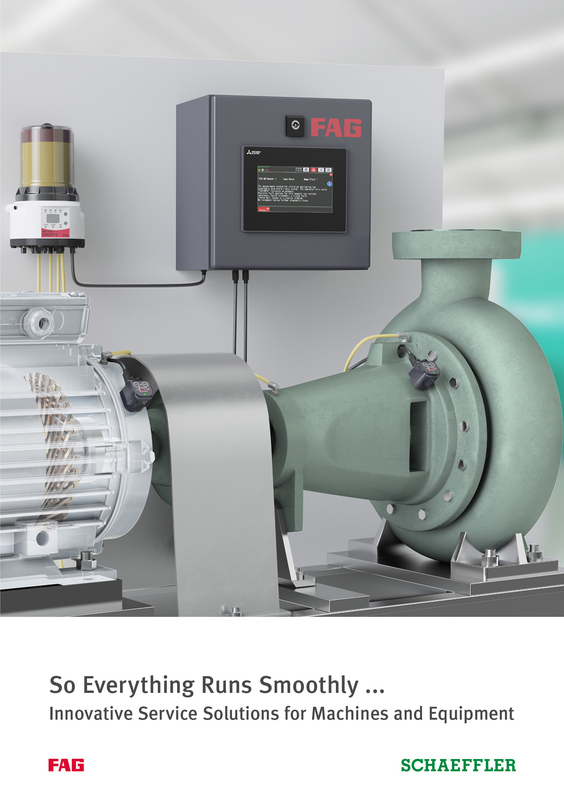 Since the device can monitor traditional and vibration-based parameters, it already offers numerous possibilities today that will be regarded as indispensable for machine monitoring tomorrow. This results in an optimized increase in value in all areas. Data can automatically be passed on via the iQ platform and the Ethernet on multiple information levels. In collaboration with Schaeffler, Mitsubishi Electric offers a holistic approach for assessing the condition of a system using SmartCheck. Data can automatically be passed on via the iQ platform and the Ethernet on multiple information levels. As the partner of Mitsubishi Electric Europe in the e-F@ctory Alliance, Schaeffler is taking a forward-looking step in the direction of Industry 4.0. The SmartCheck is playing the leading role in this process. 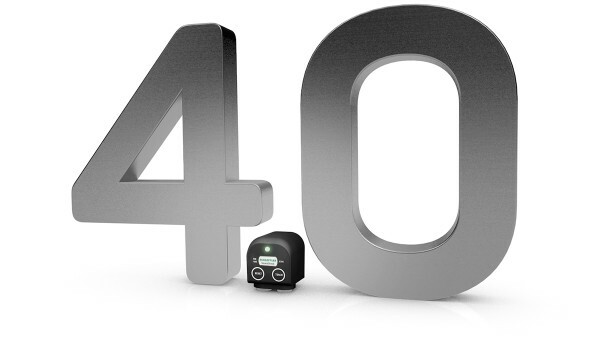 Since its product launch in 2011, the compact vibration sensor has proved its effectiveness and has been continuously further developed. Today, the SmartCheck is one of the few solutions on the market that is both suitable for use as an individual monitoring device for smaller redundant units and for integrated concepts, such as comprehensive monitoring. 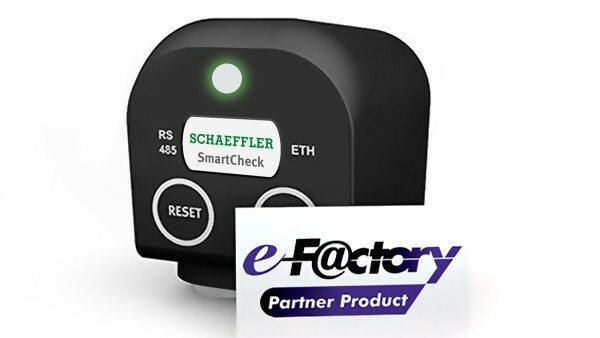 With the e-F@ctory Alliance of Mitsubishi Electric Europe, Schaeffler has found a partner that, on the one hand, makes it possible to access automation control units and process control systems and, on the other, pursues the same objectives for its customers as Schaeffler – reducing overall costs for production and maintenance and increasing productivity. As part of the e-F@ctory Alliance, Mitsubishi Electric Europe joins forces with partner companies that are recognized technology and market leaders in their respective business areas. Together they ensure that their customers are always offered the best possible complete solution for their respective automation project. The EPLAN Data Portal is an integrated, web-based data platform for provision of EPLAN compatible device data from market-leading component manufacturers for direct use in EPLAN software solutions.